This is the second in my series of articles on my test with 23andMe. I wrote yesterday about my disease risks. I am now going to look at my carrier status reports and my drug responses. 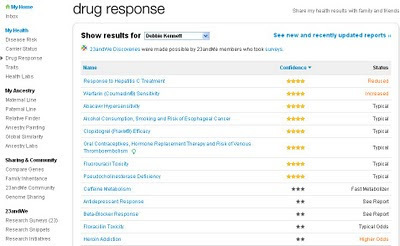 23andMe provides information on your carrier status for 24 diseases and conditions. Fortunately I tested negative for all 24 diseases. I must confess that I had not heard of the majority of diseases listed. When I explored further it transpired that many of the diseases were quite rare, and a surprisingly large number were particularly prevalent in the Ashkenazi Jewish community (eg, Bloom's syndrome, Canavan disease, mucolipidosis IV and the wonderfully named Maple syrup urine disease type 1B). I don't know whether the SNPs (single-nucleotide polymorphisms) chosen for the 23andMe test are a reflection of 23andMe's customer base or if it is simply that more research has been done into the inheritance of diseases in the Ashkenazi community. It is important to remember that there are often a large number of SNPs associated with particular diseases and 23andMe only tests a small fraction of these SNPs. It is therefore quite possible to test negative for a particular disease but still to be a carrier. To its credit, 23andMe does a commendable job of educating its customers. There is an excellent post on their blog, Absence of evidence is not evidence of absence: understanding what genetic testing can (and can’t) tell you, which explains the problem of interpretation very succinctly. 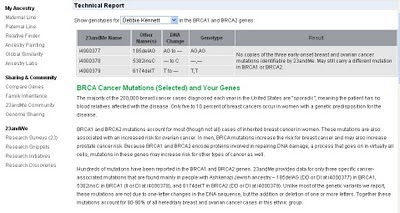 Interestingly again, the SNPs selected account for the majority of breast cancer cases in Ashkenazi Jewish women. 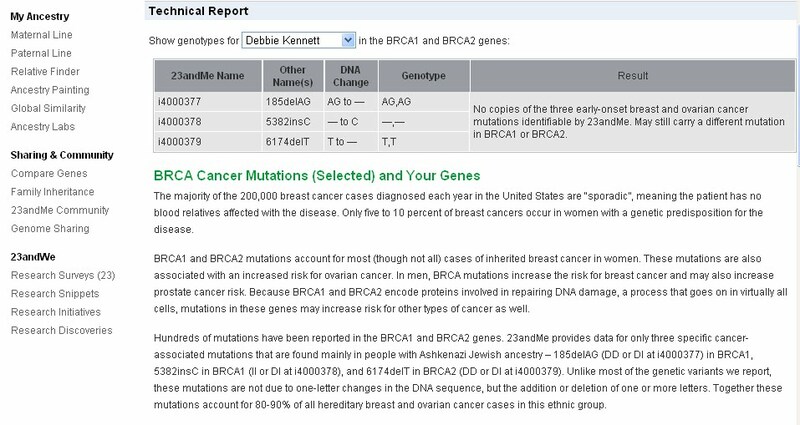 Only a tiny proportion (0.2%) of 23andMe customers test positive for the BRCA mutations. Anne Wojcicki's presentation to the Food and Drug Administration last week provides statistics on the prevalence of some of the diseases and conditions in the 23andMe database. My only quibble with the presentation of the carrier status data is that you are urged to consult a genetics counsellor if you have any questions about your results. The link provided is to a commercial genetics counselling organisation in America. This might be appropriate for an American customer who presumably has to pay to see a doctor and for whom a genetics counsellor might be a cheaper option. It is however not much help if you don't live in the US. For customers in the UK it would be more appropriate to make an appointment with a general practitioner for which of course there is no charge. 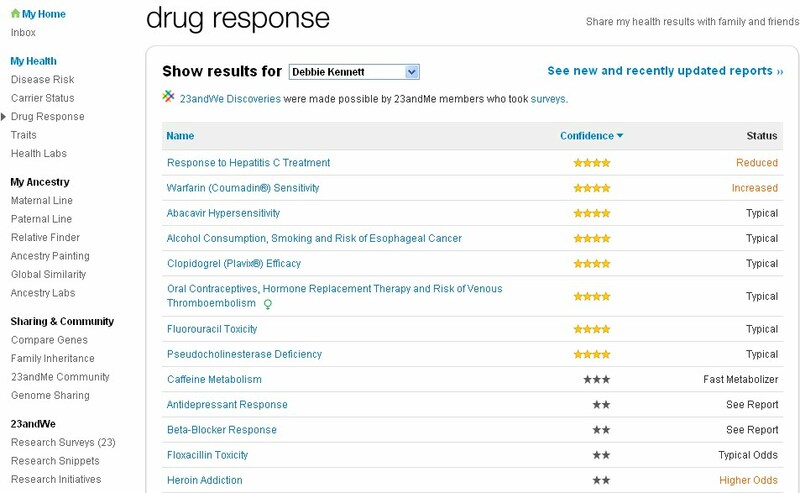 The drug responses are probably the most useful part of my 23andMe data. I have learnt that my genetics indicate that I might possibly have a reduced response to hepatitis C treatment and an increased sensitivity to warfarin. 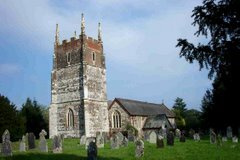 It is of course quite possible that I will never need either of these treatments but if I should do so then I am sure that the information will be beneficial to my general practitioner who might then be able to target the dosage accordingly and perhaps save the National Health Service some money in the process. I was intrigued to learn from a preliminary research report that I have a marker which means that I might be a fast metaboliser of caffeine. This would give me a reduced risk of a heart attack from drinking coffee. Although I don't like coffee I do consume large quantities of tea every day! 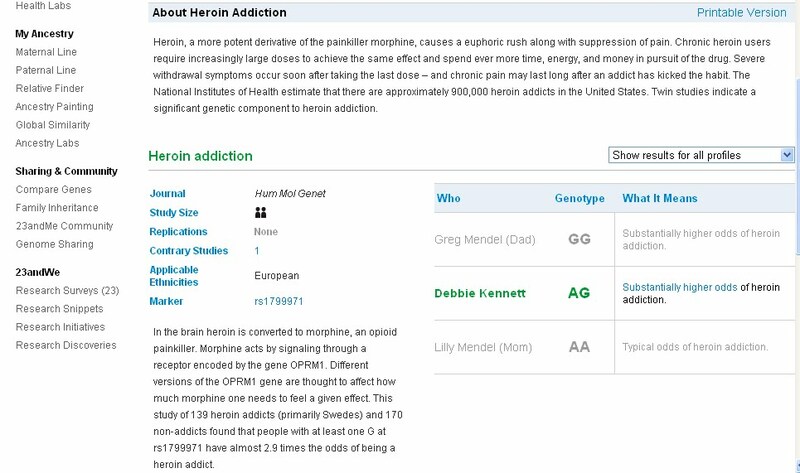 Of no practical use, but interesting nonetheless, one preliminary research report suggests that I have a genotype which puts me at substantially higher odds of becoming addicted to heroin! 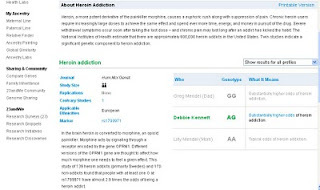 The study was carried out on just 139 heroin addicts primarily of Swedish origin and it remains to be seen if these results can be replicated. Although I've not made any major discoveries about my health it has been very interesting exploring the wealth of data on the 23andMe website. The value of the test will grow over time as more studies are published and the results are incorporated into the 23andMe database. Thanks for the post. I love 23andme and am very glad I decided to test. I got my results back in November. Congratulations on your good genes!